Apple The most valued company in the world has toped the mobile sales yet again. The sales of mobile phones in the major carriers in United States has been released recently, the report show that the Apple iPhone 5S is the top selling phone in the industry till now. This show the phones success with the consumers. 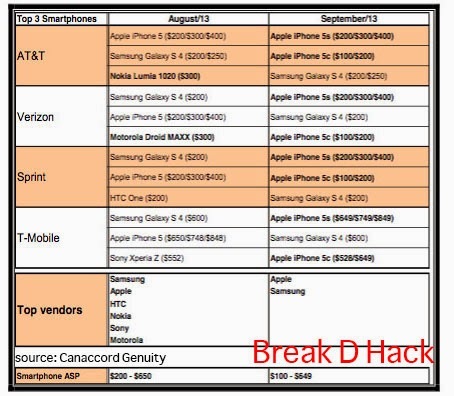 iPhone 5S has been on top of other phones from its release making the Samsung Galaxy S4 crawling as the runner up. As the next flagship released from the Samsung Galaxy S5 and the HTC M8 has released and made the Apple Phone go to the sidetrack, but its still strong, this show the brand loyalty of the apple users. Since we know Apple will release their iPhone 6 some time this year and get back with the market at the top position as always. Since the growth of Android phones many had thought that the iPhone will go down eventually but Apple has proved them all wrong with their amazing designs and awesome hardware. Hoping to see the next iPhone soon.